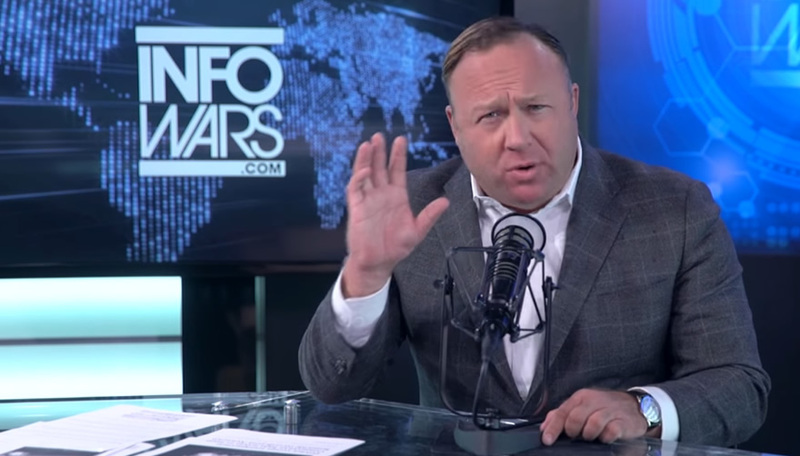 Alex Jones originally claimed Sandy Hook was an outright hoax. No situation is ever fully explained. There are always unanswered questions because it’s impossible to answer everything, especially when it involves this much terror and confusion. Even when such a question is answered, conspiracy theorists can simply pivot to a new unanswered question to replace the answered one. Alex Jones and InfoWars have built an entire conspiracy narrative that rests on countless false narratives such as this. This does not exist in a vacuum: Many people actually believe the ongoing conspiracy narrative, and act accordingly. In Megan Kelly’s interview with Alex Jones, he once again denied ever claiming asserting that Sandy Hook never happened and insisted that he merely interviewed people on different sides of the argument and that he merely played devil’s advocate. Megan Kelly was criticized by Sandy Hook victim parents and has been dropped as Sandy Hook group’s gala. Alex Jones and Info wars in general have continually perpetuated the notion that the Sandy Hook Elementary School Shooting was a hoax, or part of a government false flag in order to take away gun rights. This narrative has been pushed by continually “reminding” viewers/readers of the many “unanswered questions” (questions that range from having already been answered, many times, to being irrelevant and doing nothing to support the notion that the Sandy Hook tragedy was anything other than what was reported) and interviewing conspiracy theorists who ask similar questions. InfoWars staff members have also continued to harass family members of Sandy Hook victims. Alex Jones and his staff members have recently attempted to absolve themselves with the statement that they’re “just asking questions.” However, it’s clear that the intention of the questions are to imply that a cover up is hiding the truth. Here we’ll unpack this a bit, because it’s a perfect microcosm of the manner in which Alex Jones/InfoWars irresponsibly play on logical fallacies and unsupported (and sometimes false) claims in order to paint the picture of a vast conspiracy. The “Sandy Hook Cover Up” is but one meme that Jones pushes in order to paint the conspiracy picture. Manufactured “scandals” like Benghazi, “Dead people voting,” the Donald Trump “assassination attempt,” Google’s “Pro-Clinton Autosuggest bias,” Justice Scalia death conspiracy, The Bundy Ranch “BLM land grab,” and Milo’s Twitter ban, all of which have been covered here are also part of the broader conspiracy narrative that InfoWars has pushed (this ongoing false reporting is why they are regarded as fake news). Jones routinely rattles off theatrical questions, implications and will show video clips to support his position before then advertising his line of products, which range from male vitality supplements to doomsday preparedness products. 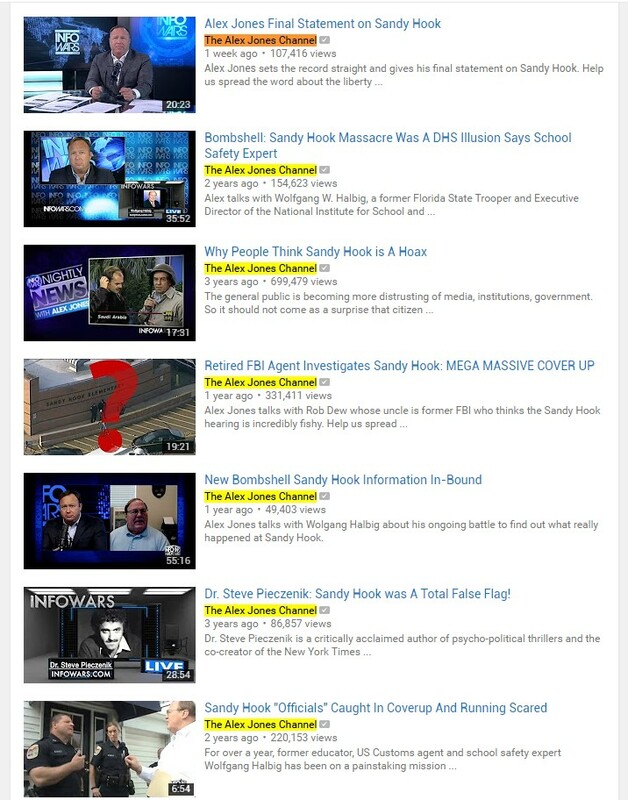 Here is a screenshot of YouTube videos from the Alex Jones channel where they are clearly pushing the Sandy Hook cover up meme. He’s denying actually believing it’s a hoax, but implying (“innocently”) that there are good reasons for believing there is a cover up. Below we’ll address a few of those but before doing so, it’s important to note that this is a common fallacy peddled by conspiracy theorists. Aerial footage shows children leaving one room of the firehouse building and walking into another room. The video loops every few seconds and there is no indication that the same children walking into one room of the building are subsequently exiting the building. Nevertheless, Sandy Hook Truthers present that as more ‘proof’ that the Sandy Hook shooting was fake. 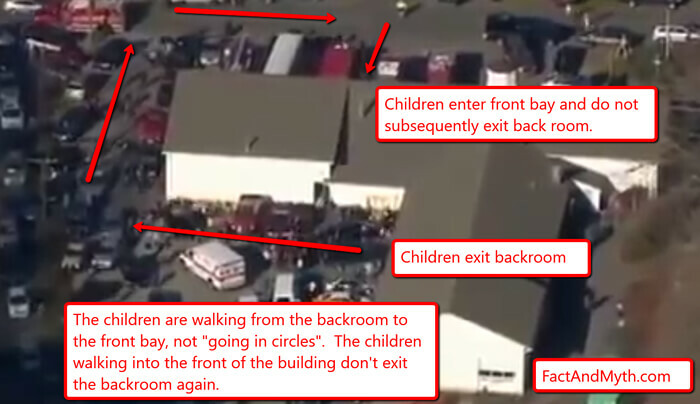 As explained on the Sandy Hook Analysis blog, as witnesses can attest, the children were being moved from the backrooms to the front bay of the firehouse. Question X is unanswered, therefore the answer is: conspiracy. This fallacy is pervasive among conspiracy theorists and it’s perhaps a bit dangerous for the following reason: No situation is ever 100% explainable. Even less so a situation involving the fright, confusion and subsequent trauma of a mass shooting. Frantic initial reports and traumatic memories are guaranteed to be scattered, inaccurate and certain incomplete. InfoWars preys on this very fact (and will combine this with convenient omissions on their part) in order to “merely imply” a cover up. Why were there no medevac helicopters on the scene? Here is Info Wars’ employee Owen Shroyer rehashing the false “unanswered questions” meme and falsely stating that Alex Jones never claimed that Sandy Hook never happened. News media outlets giving varying “early reports.” One anchor relays that he’s been told there were two guns. Another anchor relays that he’s been told there were 4. A different person relays a different early report. To the Conspiracy theorists, this proves something’s amiss. Under this mindset, someone in the background is simply changing the story line. On the other hand, it’s not unthinkable that messages were getting lost in translation and different reports were coming from different sources, in the wake of a tragic and confusing mass murder. Messages may have also gotten lost in translation. This is true even in comparatively benign cases, such as car accidents involving multiple vehicles. Police officers question multiple parties (who often have contradicting stories) in order to compile an accurate report of what occurred. Witnesses saying they saw another man in handcuffs. To the Conspiracy theorists, this suggests there was a second shooter that is being covered from the public. In an appearance he gave, Robbie Parker’s (whose daughter was among the victims) initial facial expressions suggest he’s entirely aloof and doesn’t match what we’d expect. Other explanations include the fact that people react differently to trauma. It’s also possible that Parker is emotionally detached (whether in general or just temporarily). It’s also likely that we was simply recounting memories of his daughter. They wouldn’t let paramedics and EMT’s into the building. 27 children declared dead within 8 minutes. This is simply not true. Paramedics were on the scene. Who exactly “declared 27 children dead within 8 minutes” is never really specified, nor is it ever explained why it supports a cover up. These “anomalies” are nothing more than video clips, all of which have long since been addressed, and/or at best serve as non-sequiturs. Family members of Sandy Hook victims have been repeatedly harassed by those who believe in these conspiracy theories. In fact, Noah Pozner’s father has recieved death threats. The biggest irony of all of this: Whoever is capable of organizing such a conspiracy and ensuring the family members of the shooting victims never speak up, also happens to be so inept that they leave behind these breadcrumbs (that only InfoWarriors can detect!). In fact, the organizers of these complicated conspiracies that contain multiple moving parts are the only ones who apparently make mistakes in these situations. Contradicting and confusing testimonies never signal a mistake by witnesses who just experienced the most traumatic event of their lives, it was made by cold calculating powers that be. As tempting as it may be to simply ridicule the carelessness of such reporting or the naivete of those who buy into the narrative, it merits serious attention. As our information sources become more scattered, individuals can simply pick and choose where to get their news (including fake news, like InfoWars), especially with sources that will cater to their existing confirmation bias. Those who read and buy into the Sandy Hook narrative aren’t obligated nor obliged to look for refutations of those claims. What’s more: websites like InfoWars disseminate disinformation too quickly to fact check. Often those who take the time to debunk these claims are small independent sources with small audiences. Larger, mainstream news sources are stuck with the conundrum of choosing between ignoring such claims (allowing them to go largely unchallenged) and diving into the mess, giving the claims a wider audience.